Nothing gives you more flexibility than a great folding table. 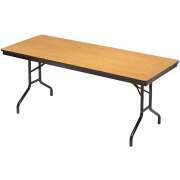 Hertz Furniture offers folding tables for sale in every size and shape. Looking for something that is lightweight and durable? 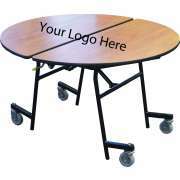 Do you need adjustable-height folding tables? We have it all - and then some. From round folding tables to rectangular to square, banquet tables to seminar tables and everything in between, Hertz Furniture has the selection you need to make the right choice. 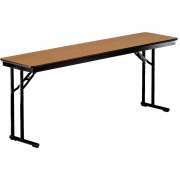 What is the strongest folding table? 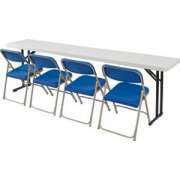 Whether you are furnishing an educational facility, activity center, or convention hall, our folding tables can withstand the toughest demands of daily use. 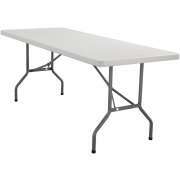 We can help you find the right folding table for any occasion. If you are hosting a company seminar or a professional development session for teachers, our training tables are perfect for you. 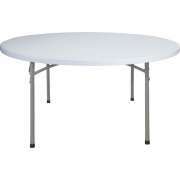 Fold up tables are great for temporary use because they are sturdy yet portable. Concerned about overburdening your custodian or damaging tables in transit? Purchase a table caddy for easy transport and convenient storage. Need a great place for the speakers in your panel discussion? Looking for a head table for a banquet or ceremony? Folding seminar tables are a great option. You can choose a basic model or one with enhanced features such as a built-in modesty panel for a more professional appearance. How can I make my folding tables look nicer? 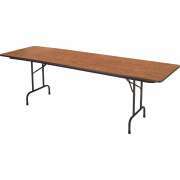 Folding tables are great for large charity events, annual banquets and awards dinners. A selection of shapes and sizes enables you to choose the perfect combination for your space. Festively adorned banquet tables can transform an auditorium, gym or social hall into an elegant dining area that is appropriate for formal events. If you are looking for that little extra something to spice up your school or office furniture, an original logo table is a great idea. You can print your original logo on a great folding table to showcase your institutional pride as you enjoy the benefits of versatility. Logo tables offer all of the portable convenience of a folding table with the added benefit of wheels. Should I get a colored folding table? In addition to the logo option, there are other ways to brighten up your institution. Folding tables are available with a choice of surface colors to liven up any room. You can order many tables in the same color, or choose to mix and match. Tables come in bright classroom colors, as well as basic white and a selection of wood tones. 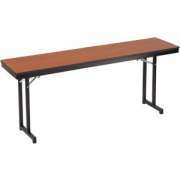 What kind of folding table should I get? A variety of surface materials lets you choose the option that best suits your needs and budget. 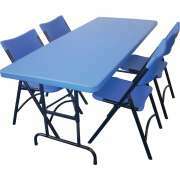 We offer particleboard foldable tables with laminate surfaces, which provide basic scratch, stain and damage resistance. 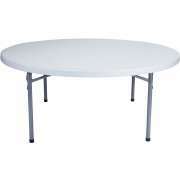 Aluminum tables are great because they are super durable. They won&apos;t dent, warp or rust, so they are a great choice for either indoor or outdoor use. 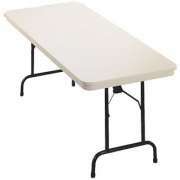 For the utmost in strength and toughness, blow molded plastic folding tables are the way to go. These tables have an unbelievable weight capacity. They resist scratches and dents, and regular stains and spills wipe right off. Even harsh chemicals are easily removed with the use of a strong solvent. Which table legs are the strongest? Folding tables also come in a selection of leg styles. Seminar tables with cantilever legs are an excellent choice because they offer increased legroom on one side of the table. For tables with people seated on both sides you can choose between t-legs, pedestal legs and the classic four-legged option. T-legs are great supports that offer more legroom on the sides. The four-legged option is ideal when people are seated on all sides of the table because it provides everyone with adequate leg room. How can I ensure that my folding table and chairs match? 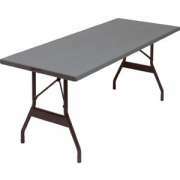 Adjustable-height folding tables offer the utmost in versatility and convenience. No matter which chairs you own or purchase to use with these tables, you can be confident that the heights are proportionate. Adjustable-height tables give you the flexibility to mix and match seating options to find the right combination for any event. Our folding tables come from leading manufacturers including National Public Seating, Midwest Folding Products and AmTab. With reliable brands to choose from, you can be sure that your folding tables will serve you well for many years. Hertz Furniture offers extended warranties on many of our fold up tables, so when you buy from us, you get the added benefit of many worry-free years. 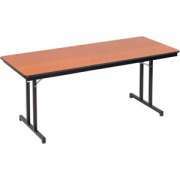 If you are looking for great folding tables at budget-friendly prices, you have come to the right address. Hertz Furniture knows how to look at your needs and preferences to help you determine the optimal choice. Our huge selection of foldable tables and years of expertise will serve you well through every step of your selection and purchasing process. Overwhelmed by the choices? Not sure where to begin? Call our design center today for a free consultation.